Ginger – a discomforting and annoying problem that everyone experience in their regular life. This problem occurs when air is trapped in the colon or small bowel. Bacterial fermentation of foods, eating behaviors, overloaded stomach, spicy foods, smoking and stress are some of the reasons behind this condition. There are many over the counter medications to treat this unpleasant problem but do you know that natural remedies can also provide the same effect? Yes, we are now going to discuss about an amazing ingredient that is readily available in every home to treat gas – Ginger. Ginger has been used to treat many digestion ailments including gas or bloating. Ginger tea compounds are used in the anti-gas medications. Ginger contains zingibain (protein digestive enzyme) reduces gas caused by protein rich foods. It has the ability to alleviate the symptoms of gastrointestinal distress. It speeds up the digestion which empties the stomach quickly and the gases can move easily into small intestine avoiding bloating. The inflammatory properties of ginger, releases and prevents excessive air trapped in colon. It stimulates the digestion process and relaxes the smooth muscles. Gingerols present in ginger fights with abdominal pain that often accompanies bloating. The carminative compound of it breaks apart pockets of gas present in the digestive tract. Extract juice from grated ginger. Add ginger juice and sugar to a glass of water and consume it. Alternatively, add 1 tablespoon each of ginger juice and apple cider vinegar to a glass of water and drink it. Repeat 30 minutes before each meal. Boil 1 cup of water and add the chopped ginger. Remove from the flame and set aside to cool down to room temperature. Add 1 teaspoon lemon juice and drink it. Alternatively, you can add 1 teaspoon honey. Mix 1 teaspoon dried ginger powder, a pinch each of asafetida and salt. Add this mixture to a glass of lukewarm water. Drink it to reduce the formation of excessive gas. Soak grated ginger in 1 teaspoon lemon juice. Eat it after having your meals. Combine 1 teaspoon each of dried ginger powder, cardamom seeds and dried ginger. Grind the mixture and store in an airtight container. Consume teaspoon of the mixture with or without water. Take it 1 hour before eating meals. Boil 2 cups of water and add 1 cup of finely chopped ginger. Remove from the heat and set aside for 25 minutes and strain the mixture. To prepare sugar syrup, add 1 cup of sugar to a cup of boiling water. After the sugar completely dissolves and the water thickens, remove from the heat and let it cool down. Combine 1/3 cup of sugar syrup and 1/2 cup each of ginger water and club soda. Drink the mixture to get instant relief from gas. For additional flavor, squeeze a lemon wedge. Mix ginger essential oil with any other carrier oil. Massage the mixture on stomach for few minutes. Repeat whenever you experience bloating. Mix 1 teaspoon each of ginger powder, dried mint leaves, black pepper and coriander seeds. Whenever you experience flatulence or indigestion, consume 1 teaspoon of the mixture followed by a glass of water. Mix equal amounts of ginger, fennel and cardamom. Add 1 teaspoon of the mixture in a cup of water and consume it. Whenever you experience excessive gas, repeat 2 times in a day. Peel and grate 100 grams of fresh and young ginger. Heat a sauce pan and add 1 cup granulated sugar and 1/4 cup water. Stir continuously until the mixture thickens to a gathering consistency. Now add grated ginger and pinch of cardamom powder. Stir occasionally and let it simmer for few minutes. Now add 2 tablespoons of all-purpose flour and stir well to avoid formation of any lumps. After 2 minutes, remove from the flame and pour the mixture in greased container. After 15 minutes, cut the mixture into 1×1 inch pieces and set aside to harden. Once the ginger candies harden store them in an airtight container. Whenever you experience bloating or indigestion, pop a candy 2 times in a day. In a pitcher that can hold at least 32 ounces of water, add 5 tablespoons lemons juice, 1 tablespoon turmeric, 1 teaspoon cayenne pepper and 1 tablespoon freshly grated ginger or ginger powder. Add 32 ounces of lukewarm water to the pitcher and set aside to steep. After 20 minutes, sip the mixture throughout the day. For added flavor, add stevia or maple syrup. Repeat whenever you feel bloated. In a quart size glass jar (airtight), add 1/2 cup dried peppermint leaves, 1/2 cup chopped fresh ginger root and 1/4 fennel seeds,. Pour boiling water just until the ingredients are covered. Fill the remaining jar with vodka or rum (food grade). Keep the jar in a cool dark place for 2 weeks. Shake the jar once in a while. After 2 – 6 weeks, strain the solution through mesh or cheesecloth. Store in vials or small containers. For adults, 1 teaspoon of the solution can be taken directly or with water. For kids, 10 – 20 drops should be enough. Repeat whenever you are experiencing excessive gas. Ginger capsules are widely available in various health stores and supermarkets. Take 100mg of ginger capsule 2 or 3 times a day whenever you experience bloating. Excessive doses of ginger can lead to diarrhea, mild heart burn or mouth irritation. Limit the daily intake of ginger to 5 to 6 grams. If you have gallstones, consult doctor before taking ginger. Avoid ginger, if you are on blood thinning medications, including aspirin. Ginger can help gastric problems during pregnancy or lactating, but make sure to consult doctor to determine if it is right for you or not. If you are about to undergo a surgery, avoid intake of ginger. 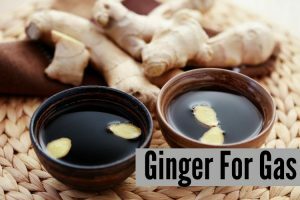 If you are diagnosed with medication conditions related to digestive system or taking any over the counter medications, then consult doctor before taking ginger. During consuming drinks with straw and chewing gum for long hours, you will swallow excess air. So avoid them. Are you going to try ginger to relieve yourself from uncomfortable gas? Share your experience in the comments section below. I have been suffering from terrible gas pains ever since a colonoscopy in March 2017. I had the colonoscopy because of daily (though painless) diarrhea that I had under fairly good control with daily Imodium. My diagnosis was microcolitis and I was prescribed pepto-bismol 3 tablets 3 X day. That’s when the gas pain started, so I stopped PB and went back to Imodium, but still have the gas pains. I have tried all kinds of special diets and nothing seems to work. Pain is especially bad during any aerobic exercise. I get some relief by pressing on the painful lump in my LLQ, which for reasons I can’t explain causes me to belch profusely. But this is really ruining my life, I can no longer travel, which I love, or even go out to dinner any more.